I love your blog. I really enjoy reading the interesting things you uncover and wondered whether you or your readership could point me in the right direction. I generally row a racing single scull here on the Yarra River in Melbourne. 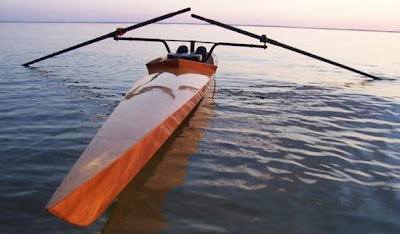 Over my years of rowing I’ve rowed all sorts of boats from timber, cedar-skinned boats to the latest honeycomb boats, but I still love the timber boats. I’ve often thought of buying an old timber single and refurbishing it, but what I’d really love to do would be to start from scratch with some plans and build my own single scull. I’ve scoured the Internet but I’ve yet to come across anywhere that has plans for a racing single scull. There are a few wide training-type boat plans available, but nothing like a “fine” boat which I like to row and occasionally race in. Do you or your readership know where I can buy such plans? That's a tricky one. The main problem, it seems to me, is that proper racing shells are now so high-tech it would be almost impossible for an amateur to build one. I wouldn't have a clue. So most designers don't bother with boats designed for serious competition but emphasise training or fitness instead. Paul Fisher has a very nice design for a clinker rowing shell, 20ft by 26.5in beam, which should go very fast but not as quick a carbon-kevlar-honeycomb job. Paul has cleverly designed it so that no glass tape is used on the outside, so it would look stunning with a few layers of varnish. I am very tempted myself by his Windrush skiff, not a shell but long and lovely. It would take a drop-in sliding rigger outfit very well. Iain Oughtred's Snipefish is an attractive boat as all Iain's designs are, relatively easy to build and handy to cartop. But at 15ft by 34in you aren't going to win any races in it (except against other Snipefish, of course). Alec Jordan of Jordan Boats does a kit for it. If you are into kit boats, Chesapeake Light Craft do the very attractive Oxford Shell (above) which is over 20ft long and just 22in wide, so it should go passably fast, if not faster. I am in a similar situation in that I would like to build something out ofd wood from scratch. I have found it difficult to get information as well so I have started designing my own shell. What have you managed to find, have you started anything? WoodenBoat.com has a "KingFisher" design that is 22'6" and looks like a nice design for a home-built job. I'm well into building a racing singles,that is sectional.so it can be taken apart and stored easier. I took the lines from Darryl Sticklers Rowable Classics. In the appendix JAKOB KASCHPER gives the lines from a 1954 Empacher single. I simply copied them on photo copier,enlarged them and cut out and transferred them to my plywood molds. i'm stripping the hull with Spanish Cedar,covering with 2 oz. fiberglass and some carbon fiber on inside. The plywood forms must be cut in three pieces so you can remove the hull! Charles N.
Wow, I would love to hear more about how you guys transferred the Kaschper/Empacher design to wood! I'm in the same "boat" as you all: I'm a recreational sculler and would love to build and row a wood boat of real racing dimensions. The Kingfisher and Oxford Shell are great, but wider than a true racing single. I'd love to hear more about how your Kaschper and Empacher designs worked out.